These and these had a baby. A really rich and sinful, salty and sweet baby. I was brainstorming last week on what kind of treat to make my Dad for his birthday. We’re on the same sweets wavelength, him and I, and with us, chocolate and peanut butter is the combo that reigns supreme. I threw around a lot of different possible creations but we were celebrating at the lake and I knew what I made had to be portable and easy to serve. He had recently gushed about a peanut butter brownie that he had tried and that got me thinking. I morphed two of my favorites and the result was THESE. 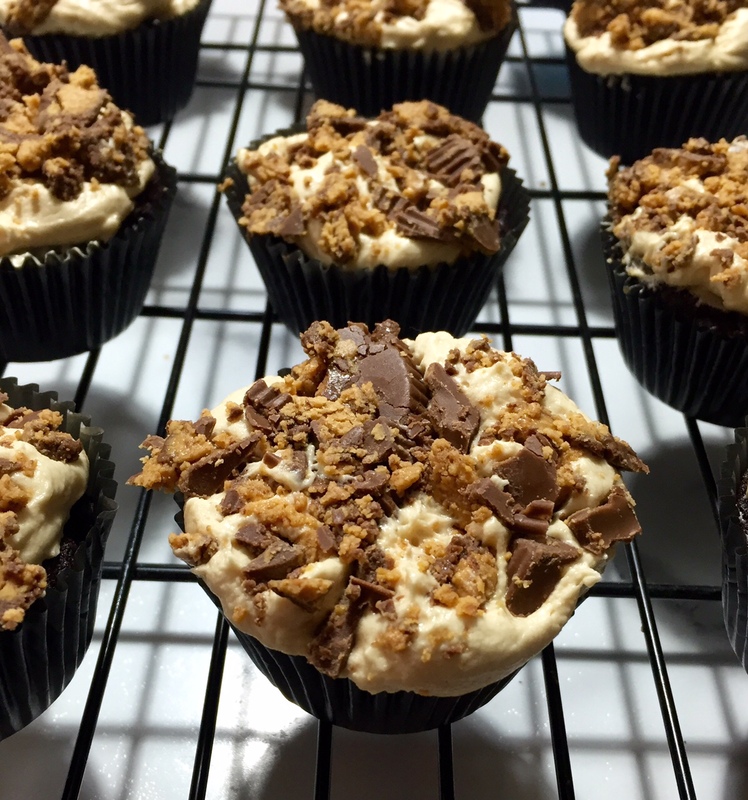 A thick, chewy homemade brownie cup with a layer of salty peanut butter buttercream and crumbles of peanut butter cup on top. I mean, look at these things. Pass the milk! You’ll need it. Preheat oven to 325 degrees. Line a standard muffin tin with liners and set aside. Mix the butter, oil and sugar together until well mixed. Stir in the eggs and vanilla, and then add in the dry ingredients, mixing until very well combined. Batter will be very thick. Divide batter evenly in the prepared cupcake tin. Bake for about 20-22 minutes, until center of cupcakes is just set. Do not over bake. Let cupcakes cool in the tin for 30 minutes, then turn out of the tin and cool for at least another 30 minutes before icing. Cream peanut butter and butter together with electric mixer. Mix icing sugar in on low speed until blended, then add vanilla and milk. Beat until incorporated. Add more milk or icing sugar if needed depending on desired consistency. Beat until smooth. This frosting is VERY thick and if you are wanting to pipe it, you will probably need more milk. 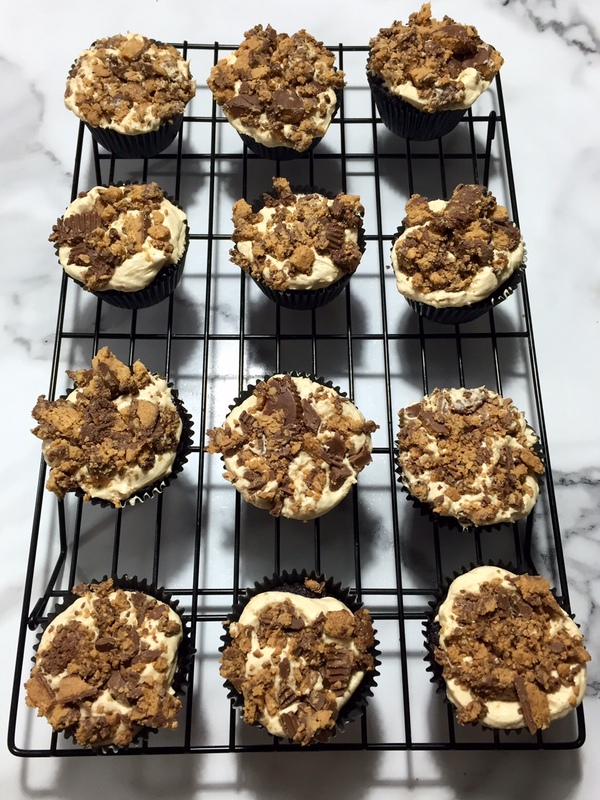 Ice each cooled cupcake and garnish with chopped peanut butter cups. I couldn’t stop eating these ! The icing was not too sweet and the peanut butter cups took things to a whole new level !